Extracellular aspartic proteinase (MCAP) produced by Mucor circinelloides in solid state fermentations has been shown to possess milk clotting activity and represents a potential replacement for bovine chymosin in cheese manufacturing. Despite its prospects in the dairy industry, the molecular characteristics of this enzyme remain unknown. This work focuses on MCAP cloning and optimization of heterologous expression in Pichia pastoris, and characterization of the enzyme. The cloning of cDNA sequence encoding MCAP from M. circinelloides was performed using a fragment of approximately 1 kbp as a probe. The fragment was amplified using non-specific primers designed from the NDIEYYG and KNNYVVFN consensus motifs from aspartic proteinases of different fungi. Gene specific primers were designed to amplify a full-length cDNA using SMART™ RACE PCR. MCAP was expressed in P. pastoris under the control of the constitutive GAP promoter. It was shown that P. pastoris secreted non-glycosylated and glycosylated MCAPs with molecular weights of 33 and 37 kDa, respectively. A novel MCAP was expressed in P. pastoris and efficiently secreted into the culture medium. The expression of the heterologous proteins was significantly increased due to advantages in codon usage as compared to other expression systems. The results suggest that P. pastoris could be exploited as a safe production platform for the milk clotting enzyme. Rennet, a milk coagulant from the abomasum of milk-fed calves and lambs, is the industrial gold standard in cheese manufacturing . Chymosin is the major milk-clotting component of natural rennet preparations obtained from young animals as its activity amounts to 90% of the total observed potency . However, due to increased demand in cheese products, animal-derived milk coagulants are not sufficient to cover the production. Therefore, the demand has prompted increased research efforts in the manufacture of recombinant and microbial rennin . Nevertheless, the rennin of microbial origin might be contaminated by other enzymes which might affect cheese ripening by causing bitterness during storage . Until now, several aspartic proteinases (APs) such as pepsin, rennin, renin, and cathepsin D have been extensively studied. Microbial APs such as rhizopuspepsin and penicillopepsin have been reported to be either intracellular or extracellular enzymes with most of them having been cloned and purified. For example, acid proteinase from Metschnikowia reukaufii has been cloned and expressed in Escherichia coli while three clt genes encoding milk-clotting proteinases from Myxococcus xanthus have been cloned and expressed in E. coli, Saccharomyces cerevisiae and P. pastoris. It is also known that fungal extracellular thermophilic proteinases from R. miehei and R. pusillus are still used as substitutes for calf chymosin in cheese manufacturing . However, the enzymes are extensively proteolytic which may result in impaired cheese organoleptic characteristics. Moreover, the proteinases are resistant to heat treatment compared to bovine chymosin and thus can remain active in the curd for longer periods of time . Additionally, proteinases with low heat stability have been observed in M. varians and M. circinelloides. Although studies on the characterization of an acid proteinase from M. circinelloides were performed, the molecular characteristics of the enzyme remain unknown. The mentioned thermo-labile proteinases may provide technological advantages for industrial utilization. 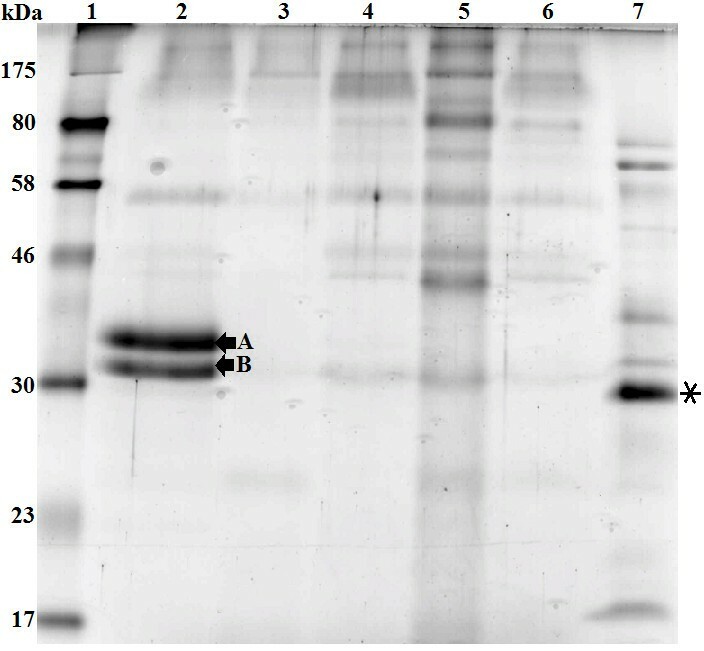 In this work, the cloning and expression of the aspartic proteinase from M. circinelloides was performed. The microorganism used as the source of the gene encoding MCAP was M. circinelloides strain DSM 2183 (Deutsche Sammlung von Mikroorganismen und Zellkulturen GmbH, Braunschweig, Germany). E. coli strain TOP10  was used to amplify the plasmids carrying the cloned gene. E. coli strains were grown overnight in Luria-Bertani medium (10 g L-1, tryptone, 5 g L-1 yeast extract, 5 g L-1 NaCl) at 37°C, 220 rpm. P. pastoris was grown in YPD medium (10 g L-1 yeast extract, 20 g L-1 peptone, 20 g L- 1 glucose) at 30°C for 3 days with shaking at 250 rpm. When required, the final antibiotics concentration for ampicillin was 100 μg mL-1 while for zeocin it was either 30, 50 or 100 μg mL-1. Plasmid pGAPZα-A (Invitrogen, Darmstadt, Germany) was used as the cloning and expression vector. Table 1 shows the plasmids and strains used in this study. The pGAPZα-A vector use the GAP promoter to constitutively express recombinant proteins in Pichia pastoris. Contains the zeocin resistance gene (Sh ble). pGAPZα-A derivative carrying the whole MCAP gene1. pGAPZα-A derivative carrying the MCAP gene without an intron1. pGAPZα-A derivative carrying the MCAP gene without an intron2. pGAPZα-A derivative carrying the MCAP gene without a signal sequence and without an intron2. pGAPZα-A derivative carrying from the amino acid sequence number 67 to 394 of the MCAP gene without an intron1. pGAPZα-A derivative carrying the MCAP gene without signal sequence and without intron. The original MCAP gene was adapted to the optimal codon usage of P. pastoris. The insert was cloned flush with the Kex2 cleavage site and in frame of the α- factor signal sequence and in frame with the C-terminal polyhistidine tag into the XhoI and NotI site of the pGAPZα-A. 1The insert was cloned in frame with the α-factor signal sequence and in frame with the C-terminal polyhistidine tag into the EcoRI and NotI sites of the pGAPZα-A. 2The insert was cloned flush with the Kex2 cleavage site and in a frame of the α-factor signal sequence and in a frame with the C-terminal polyhistidine tag into the XhoI and NotI site of the pGAPZα-A. For genomic DNA extraction, M. circinelloides DSM 2183 spores (1 × 105 spores) were inoculated into potato dextrose agar plates (PDA) which were incubated at 24°C for 3 days. The PDA medium was prepared according to the supplier’s protocol (Difco, Detroit, MI, USA). About 250 mg of fresh mycelium were collected with tweezers in a 1.5 mL vial. The mycelium were washed with sterile water and centrifuged at 5000 g for 2 min. The spores were lysed in 466 μL TE buffer (10 mM Tris-Cl, pH 8.0, 1 mM EDTA) with 3 μL Proteinase K (20 mg mL-1), 1 μL RNAse (10 mg mL-1) and 30 μL SDS (100 mg mL-1). The suspension was mixed gently to avoid shearing the chromosomal DNA, followed by incubation at 37°C for 1 h. The precipitated DNA was collected by centrifugation (15000 g, 10 min at 4°C), followed by phenol-chloroform extraction and ethanol precipitation as described . Restriction enzymes (EcoRI, XhoI, NotI and AvrII), T4 DNA ligase and Taq DNA polymerase were purchased from New England Biolabs (Frankfurt, Germany). All enzymes were used under the conditions specified by the manufacturer. Plasmids were isolated using a QIAprep Spin Miniprep Kit (QIAGEN, Hilden, Germany), and the PCR products were purified with the QIAquick PCR Purification Kit (QIAGEN, Hilden, Germany). PCR reactions were performed in a (total volume of 50 μL) Mastercycler ep gradient S (Eppendorf, Hamburg, Germany). The recovered PCR fragments and plasmids were sequenced by Eurofins MWG Operon (Ebersberg, Germany). Plasmids were transformed into E. coli and P. pastoris using a Multiporator (Eppendorf, Hamburg, Germany), according to the supplier’s protocol. To obtain the full-length cDNA of MCAP gene, total RNA was isolated from solid-state culture of the M. circinelloides as follows: 250 mL Erlenmeyer flasks containing 10 g of wheat bran moistened with 200 mM HCl, up to a water content of 120% on a dry basis, and autoclaved at 121°C for 20 min, were inoculated with 5×106 spores of M. circinelloides. Cultured for four days at 24°C, 100 mg of the mycelium were collected with tweezers and immediately used for total RNA extraction using the RNeasy Plant Mini Kit (QIAGEN, Hilden, Germany). The concentration and quality of the total RNA was determined by using the NanoDrop ND-1000 spectrophotometer (NanoDrop Technologies, Inc. Wilmington, Delaware, USA). Two microgram of total RNA were used for the synthesis of the first strand of 5′-RACE-Ready cDNA and 3′-RACE-Ready cDNA. The synthesized first strand cDNA was used as a template for the 5′-RACE cDNA and 3′-RACE cDNA using the gene specific reverse primer GSP-Mucor-2R and forward primer GSP-Mucor-1 F, respectively (Table 2). In these cases, the conditions for PCR reactions were as described by Clontech (SMART RACE cDNA Amplification Kit User Manual). The amplified RACE fragments were separated by agarose gel electrophoresis and recovered using NucleoTrap Gel Extraction Trial Kit (Takara Europe-Clontech, Saint-Germain-en-Laye, France). Using this technique, the sequences of the extreme ends of the MCAP gene (5′and 3′) were obtained. Finally, the full-length cDNA sequence of the aspartic proteinase of M. circinelloides (deposited in GenBank under accession number JQ906105) was amplified from the 5′-RACE-Ready cDNA while the genomic MCAP of the aspartic proteinase (deposited in GenBank under accession number JQ906106) was amplified from genomic DNA of M. circinelloides using the forward primers APMC-Met-F and the reverse primer APMC-stop-R (Table 2). The underlined sequences (GAATTC; EcoRI, CTCGAG; XhoI and GCGGCCGC; NotI) represent the additional restriction sites at the 5′ ends of forward and reverse primers. The lowercase letters indicate the Kex2 cleavage sites. The primers (for First-strand cDNA synthesis, 3′-RACE cDNA and 5′-RACE cDNA) provided in the SMART RACE cDNA Amplification Kit (Clontech) are not described in the table. The PCR reactions contained the following components each listed at their final concentrations: 1 × Advantage 2 PCR Buffer, 200 pmol μL-1 dNTPs, 2 pmol μL-1 of each primer (forward and reverse), 2.5 μL of 5′ first-strand cDNA (unknown concentration), 1 × Advantage 2 Polymerase Mix (Clontech, Palo Alto, CA, USA). PCR was carried out at an annealing temperature of 61°C. To clone the full-length cDNA encoding MCAP in M. circinelloides, a partial sequence of genomic DNA of the acidic proteinase gene was first obtained. Non-specific primers (12 ND-F and M.cir-2R) (Table 2) were designed using the conserved motifs of aspartic proteinases from different species of filamentous fungi (Figure 1). In this case, the amino acid sequence of the Mucor bacilliformis proteinase  and those of Rhizopus microspores var. rhizopodiformis (accession number CAA72511), Rhizopus niveus (accession number Q03700), Rhizopus microspores var. chinensis (accession number AAB59306), Rhizopus microsporus var. chinensis (accession number AAA33881), Rhizopus microsporus var. chinensis (accession number AAA33879) and Syncephalastrum racemosum (accession number AAC69517) were downloaded from the GenBank and aligned with BLAST. Multiple alignment of the consensus motifs sequences NDIEYYG and FLKNNYVVFN of several fungal aspartic proteinases. Consensus motifs sequences are marked in black arrows. Asterisks indicate conserved amino acids. The number to the right of the amino acid sequence is based on the protein. After PCR, a 956 bp fragment was obtained. PCR amplification was carried out at an annealing temperature of 52°C using 1.25 U Taq DNA polymerase and 200 ng of genomic DNA. The deduced amino acid sequence of the product was aligned with the amino acid sequence of aspartic proteinase from M. bacilliformis, R. niveus (accession number X56992) and R. microsporus var. chinensis (accession number M63451) using BLAST algorithm. Since the fragment sequence showed high similarity to the selected proteinases, gene-specific primers were designed to perform 5′-RACE and 3′-RACE as well as for the amplification of a full-length cDNA of the aspartic proteinase gene from the first strand 5′-RACE-Ready cDNA of M. circinelloides by SMART™ RACE PCR Kit (Takara Europe-Clontech, Saint-Germain-en-Laye, France). A set of expression plasmids were constructed by cloning a partial MCAP, whole MCAP, or SyMCAP gene in frame with the alpha-factor (α-MF) secretion signal and the C-terminal polyhistidine tag (6x His tag) into the multiple cloning site of pGAPZα-A, indicating that all MCAP products were cloned downstream of the glyceraldehyde-3-phosphate dehydrogenase (GAP) promoter . The whole MCAP coding sequence (with intron sequence) was amplified from M. circinelloides genomic DNA while the full-length cDNA (without intron) or partial sequence cDNA (without signal peptide and without intron) encoding MCAP was amplified from the 5′ of the first strand cDNA. The final concentrations of components for PCR of recombinant plasmids was: 1 × ThermoPol reaction buffer, 200 pmol μL-1 dNTPs, 2 pmol μL-1 of each primer, 1 ng μL-1 plasmid DNA, 0.04 units μL-1Taq DNA polymerase. The first round of PCR amplification was carried out at 63°C for 5 cycles, and the second round of amplification was at 66°C for 25 cycles. To construct the plasmids pGAPZα+MCAP, pGAPZα+MCAP-2, pGAPZα+MCAP-SP1, pGAPZα+MCAP-3 and pGAPZα+MCAP-5, the PCR reactions were carried out using the following forward primers: APMC-F, APMC-Met-F, APMC-EcoNaeI-F, XhoI-N-MCAP-F and MCAP-3 F, respectively. 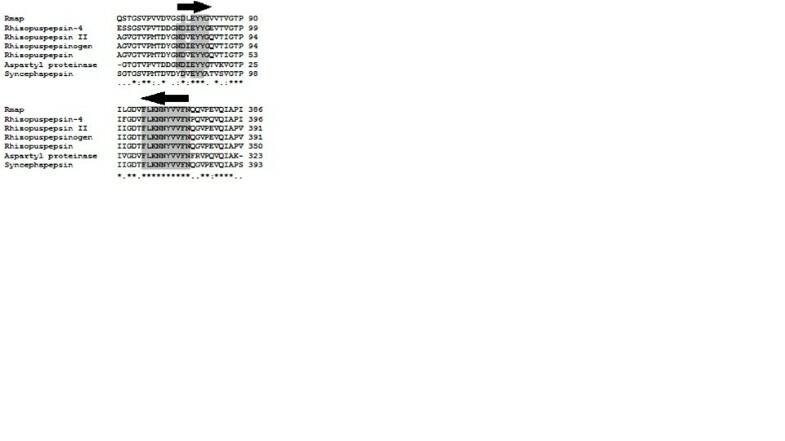 While the reverse primer APMC-NotI-R was used in all the PCR reactions (Table 2). The PCR products were purified as previously described and were digested using restriction enzymes for which specific sites had been previously added using primers. The digested PCR products were then ligated into the appropriate sites of the multiple cloning site of pGAPZα-A using T4 DNA ligase. Additionally, original MCAP was adapted to the optimal codon usage of P. pastoris and cloned in frame with DNA sequence for the N-terminal α- factor signal sequence, under the GAP promoter (performed by MWG Operon, Ebersberg, Germany). The final plasmid construct was designated as pGAPZα+SyMCAP-6. The ligated products were transformed into electrocompetent E. coli cells with further selection in LB-zeocin plates and expression was performed using P. pastoris X-33. To examine the expression of MCAP constructs in P. pastoris under the control of GAP promoter, recombinant plasmids were digested by AvrII restriction enzyme and transformed into P. pastoris competent cells (Invitrogen, Darmstadt, Germany). Eighty microlitres of P. pastoris cells were mixed with 2.5 μg of linearized recombinant plasmids. The transformation mixture (100 μL) was plated on YPD agar plates supplemented with zeocin (100 μg mL-1) and incubated at 30°C for 4 days. In order to confirm that P. pastoris contained the recombinant plasmid, PCR and sequence analysis were performed as previously described. For the production of MCAP in P. pastoris, starter cultures of single colonies of transformants were grown in 25 mL YPD media in 100 mL shake flasks for 20 h at 30°C. The cultures were inoculated in triplicate in 75 mL YPD in 250 mL shake flasks to a starting OD600 of 0.1. Cultivation was carried out for 4 days. Considering that glucose concentrations above 40 g L-1 did not show any increase in MCAP activity, enzyme expression was performed in 20 and 40 g L-1 glucose and adjusted to an initial pH of 5.0 and 7 with citric acid. In order to analyze the effect of temperature in the culture medium on MCAP expression, recombinants were grown at 23, 24, 25, 27 and 30°C, at initial pH of 5.0. The supernatant from cultures was taken every 24 h and cells were harvested by centrifugation at 4000 g at 4°C. Thereafter, milk clotting enzyme activity was analyzed in the supernatant broths. The supernatant culture from wild type P. pastoris was used as a negative control. To analyse MCAP production by M. circinelloides, 6 day cultivation was performed in solid-state reactor. The crude extract was obtained according to the method of Areces and coworker  and assayed daily in duplicate. The obtained protein was considered as a control reference MCAP. The amount of protein in the crude extract, supernatant broth, as well in the chromatographic fractions was determined according to the Bradford procedure  and bovine serum albumin served as a standard (Fischer Scientific, Schwerte, Germany). All chromatographic experiments were done using an ÄKTA purifier system (GE Healthcare, Munich, Germany). After removal of the cells by centrifugation at 4000 g, 4°C, he MCAP recombinant protein was purified from the supernatant by cation-exchange chromatography using a 5 mL HiTrap SP FF column attached to the ÄKTA purifier. The protein extract was adjusted to pH 3.1 using citric acid, and then a range of 37–48 mL of the mixture was injected to the previously equilibrated column with 50 mM citric acid buffer pH 3.5 and 75 mM NaCl. After washing with the same buffer and 75 mM NaCl, the elution was performed with the same buffer and 200 mM NaCl and step gradient was developed in 5 column volumes with a flow rate of 1 mL min-1. For protein content and milk clotting assays, 2.5 mL of chromatographic fractions were collected and analyzed. The crude extracellular supernatant proteins were desalted using a PD-10 column (GE Healthcare, Munich, Germany) equilibrated with 20 mM phosphate buffer at pH 7.2. These recombinant products were about 10 times concentrated at room temperature using Vacuum Concentrator 5305 (Eppendorf, Hamburg, Germany) and applied to a 12.5% SDS-PAGE. Purified enzyme and crude control reference MCAP were loaded directly into the SDS-PAGE gel and stained with Coomassie Brilliant Blue. The milk clotting activity was analyzed according to the method of Arima and coworkers, with some modifications . Initially, 1 mL of substrate made of 100 g L-1 skimmed milk powder and 10 mM CaCl2 in distilled water was added to a 10 mL test tube and the contents were incubated at 35°C for 10 min. Afterwards, 0.1 mL of enzyme sample was added to the pre-incubated substrate. One milk clotting unit (MCU) was defined as the enzyme amount which clotted 1 mL of the substrate within 40 min at 35°C . Based on this definition, the clotting activity was calculated according to equation of Rao and coworker , (Equation 1). where 2400 is the conversion of 40 min to s, t; clotting time (s) and E; the enzyme volume (mL). About 35 μg of crude extracellular protein from the recombinant X-33/pGAPZα+MCAP-5 cultivated in YPD medium at initial pH of 5.0 was digested with 2 units of endoglycosidase H (endo H) (New England Biolabs, Frankfurt, Germany) at 37°C for 2 h. The crude protein had previously been desalted using a PD-10 column and equilibrated with 20 mM phosphate buffer, pH 6.0. Proteolytic activities (PA) of obtained chromatographic fractions were measured by the method of Fan and coworkers using N,N-dimethylcasein (DCM) as the substrate . For the assay, 10 mg of DCM was dissolved in 1 mL of 20 mM phosphate buffer, pH 5.8. Subsequently, 45 μL of the solution was thoroughly mixed with 45 μL of enzyme sample and incubated at 35°C for 30 minutes. The reaction was stopped using 1.35 mL of 10% ice-cold trichloroacetic acid (TCA). The reaction sample was kept on ice for 30 min and later centrifuged at 15000 g for 15 min. The absorbance of the mixture was measured at 280 nm. To make the reference solution, TCA was added before the enzyme. One unit of proteolytic activity (U mL-1) was defined as the amount in microgram of tyrosine released from DCM per minute at 35°C. The extinction for tyrosine was taken as 0.005 mL μg-1 cm, (Equation 2). where V is volume in mL. The gene encoding MCAP was amplified by PCR from M. circinelloides strain DSM 2183. 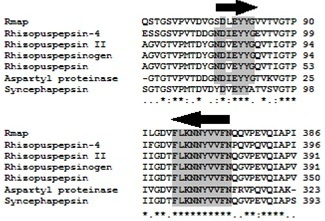 A 959 bp fragment was amplified using primers designed based on homology against NDIEYYG and KNNYVVFN consensus motifs from aspartic proteinase of various species of filamentous fungi (Figure 1). The deduced amino acid sequence of the obtained 959 bp fragment indicated the presence of catalytic Asp residues found in most known aspartic proteinases. In aspartic proteinases, the catalytic Asp residues is found within the motif Asp–Xaa–Gly in which Xaa can be either Ser or Thr . After obtaining the partial DNA sequence of MCAP, specific primers were designed for the amplification of 3′-RACE and 5′-RACE of aspartic proteinase gene from the first-strand cDNA of M. circinelloides by SMART™ RACE PCR. The full-length cDNA of the aspartic proteinase from M. circinelloides was amplified from the 5′ first-strand, while the full-length MCAP encoding the aspartic proteinase was amplified from genomic DNA of M. circinelloides. By comparing the nucleotide sequence of aspartic proteinase amplified from the 5′first-strand cDNA with the sequence amplified from the genomic DNA of M. circinelloides, we found that the whole MCAP has an intron of 63 bp long and encodes 394 amino acid residues (Figure 2). The amino acid sequence of M. circinelloides MCAP was further aligned with the M. bacilliformis sequence and with non-redundant protein database using BLASTX 2.2.24. The highest similarity between the MCAP amino acid sequence and a M. bacilliformis homolog was found to be 88% identity. The identity with R. oryzae (accession number ACL68088), R. microsporus (accession number CAA72511), R. microsporus var. chinensis (accession number AAB59305), R. niveus (accession number CAA40284), and S. racemosum (accession number AAC69517) was 66, 65, 64, 63, and 59%, respectively. The Nucleotide and deduced amino acid sequence of MCAP protein. The deduced amino acid sequence is shown under the nucleotide sequence. The arrow indicates the proposed signal peptide cleavage site and lowercase letters indicate nucleotides in the intron sequence. The proposed catalytic Asp residues (motifs DTGS and DTGT) are boxed. The potential N-glycosylation site is underlined. Asterisk indicates the position of the stop codon (TAA). The analysis of the amino acid sequence by a SignalP 3.0 server identified a cleavage signal sequence site between positions Ala21 and Ala22 in the MCAP protein (http://www.cbs.dtu.dk/services/SignalP/). The putative signal peptide corresponding to the first 21 amino acids; MKFSLVSSCVALVVMTLAVDA, shows features of signal peptides, such as a highly hydrophobic region. Additionally, by using the NetNGlyc v1.0 server (Center for Biological Sequence Analysis, Technical University of Denmark DTU), one potential N-glycosylation site; Asn–X–Ser/Thr, was found to be at positions Asn331 in the MCAP (Figure 2). To analyze the expression of MCAP gene in P. pastoris, a set of recombinant plasmids carrying either the partial or the whole MCAP gene, was cloned into the P. pastoris expression vector pGAPZα-A. The secreted MCAP forms were separated by SDS-PAGE. The analysis showed that the recombinant yeast X-33/pGAPZα+MCAP-5 expressed two forms of MCAP when cultivated in YPD medium at pH 5.0 (Figure 3, lane 2, Figures 4A and 5) as well as the recombinant yeast X-33/pGAPZα+SyMCAP-6 (Figures 4B, and 5, lanes, 6 and 7). The molecular mass of the largest protein was 37 kDa while that of the smallest protein was 33 kDa. Both proteins seem to have 2.5 kDa of the additional amino acids of the C-terminal polyhistidine tag since the molecular mass was distinctly higher than 30 kDa of the single MCAP from M. circinelloides (Figure 3, lane 7). It was confirmed that, MCAP was expressed in two forms; one glycosylated and the other non-glycosylated. Incubation of the MCAP with endo H resulted in the decrease in the apparent molecular weight (Figure 4A), giving values identical to those of the authentic MCAP from M. circinelloides. SDS-PAGE analysis of the extracellular extract from recombinants X-33/pGAPZα +MCAP-2, X-33/pGAPZα+MCAP-3, X-33/pGAPZα+MCAP-5, X-33/pGAPZα+MCAP-SP1, M. circinelloides and P. pastoris X-33 (wild-type). 25 μg of the concentrated protein products were subjected on each lane of SDS-PAGE. Samples: Lane 1, molecular standards (kDa); lane 2, secreted expression from recombinant X-33/pGAPZα+MCAP-5; lane 3, P. pastoris X-33 (negative control); lane 4, X-33/pGAPZα+MCAP-2; lane 5, X-33/pGAPZα+MCAP-3; lane 6, X-33/pGAPZα+MCAP-SP1; and lane 7, secreted expression from M. circinelloides. The asterisk indicates the authentic MCAP. The arrows indicate the expressed forms (A and B) of MCAP protein. SDS-PAGE electrophoretic pattern comparisons of recombinant P. pastoris . (A) Enzymatic analysis of the MCAP protein with endoglycosidase (Endo H). 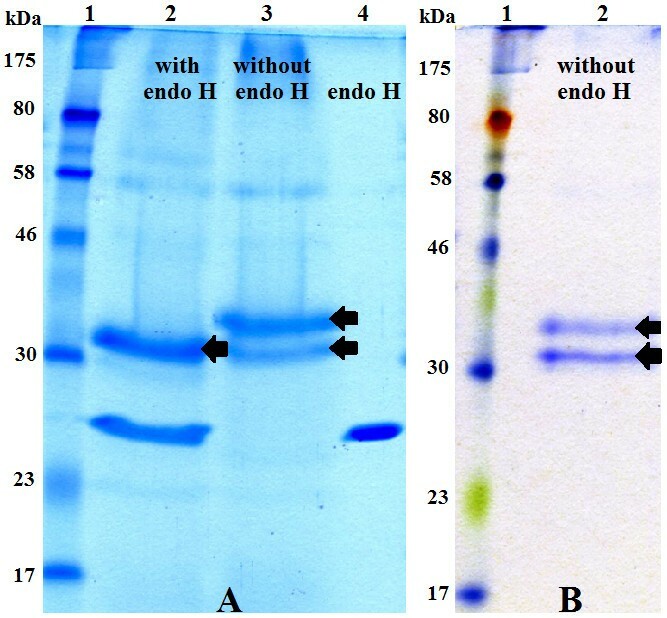 25 μg of the protein products were digested with endo H and subjected to SDS-PAGE. Lane 1, molecular standards; lane 2, secreted expression from X-33/pGAPZα+MCAP-5 (digested); lane 3, secreted expression from X-33/pGAPZα+MCAP-5 (undigested); lane 4, endo H. The arrows indicate the expressed forms of MCAP protein (above N-glycosylated protein, below the deglycosylated protein, respectively). 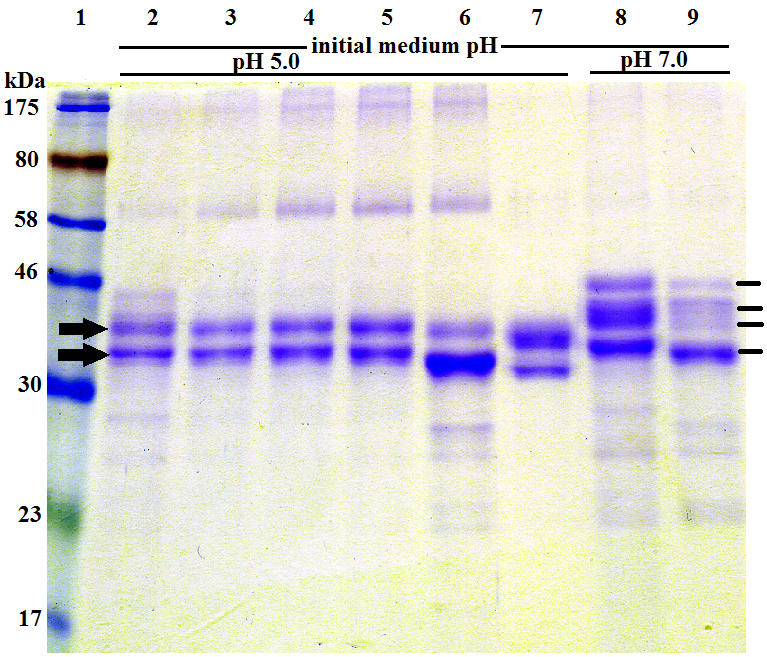 (B) Analysis of the purified MCAP protein on HiTrap SP Sepharose Fast Flow. Lane 1, molecular standards; lane 2, 10 μg of secreted expression from recombinant X-33/pGAPZα+SyMCAP-6. The arrows indicate the expressed forms of MCAP protein (above N-glycosylated protein, below the deglycosylated protein, respectively). Kinetics and forms of MCAP secreted by recombinant X-33/pGAPZα+MCAP-5 and X-33/pGAPZα+SyMCAP-6. Recombinants were cultured for 24, 48, 72 and 96 hours in YPD medium (initial medium pH: 5.0 and 7.0) at 24°C. Proteins in the sample corresponding to 37 μL of the original supernatant broth were loaded on each lane of SDS-PAGE. Samples: Lane 1, molecular standards (kDa); lanes 2, 3, 4, 5, and 8, secreted expression from recombinant X-33/pGAPZα+MCAP-5 (lane 2, 24 h; lane 3, 48 h; lane 4, 72 h; lane 5, 96 h; lane 8, 72 h); lanes 6, 7, and 9, secreted expression from recombinant X-33/pGAPZα+SyMCAP-6 after 72 hours of cultivation. Lane 7, 4 μg of purified MCAP protein on HiTrap SP Sepharose Fast Flow. The arrows indicate the expressed forms of MCAP protein when the initial pH value of the medium was 5.0 and the lines indicate the expressed forms of MCAP at initial pH of 7.0. None of the other recombinants analyzed in this study was able to produce MCAP. It is possible that P. pastoris containing plasmid pGAPZα+MCAP (data not shown) was unable to cleave the MCAP gene intron sequence. Such a situation has been shown in S. cerevisiae that did not secrete R. niveus aspartic proteinase as it contained an intron sequence . In the case of strain containing pGAPZα+MCAP-2 and pGAPZα+MCAP-3 (Figure 3, lanes 4, 5, respectively), the start codon of α-MF secretion signal and start codon of MCAP are each very close to the promoter, which might have caused some inhibition of transcription. The unsuccessful result of X-33/pGAPZα+MCAP-SP (Figure 3, lanes 6) could have been due to the deleted part of MCAP proenzyme sequence, which is very important for its conversion to the mature form. The activity of the MCAP produced by the recombinant X-33/pGAPZα+MCAP-5 grown in two concentrations of glucose as the sole carbon source in the YPD medium at pH 5.0 and 24°C was compared. When glucose was used at 20 g L-1 the relative activity of MCAP decreased to 40% compared to a glucose concentration of 40 g L-1. The time course of MCAP production by X-33/pGAPZα+MCAP-5 (Figures 5 and 6A) showed that after 24, 48, 72 and 96 h of growth the activity of the crude enzyme was 13 (7 mg L-1), 172 (54 mg L-1), 257 (110 mg L-1) and 181 MCU mL-1 (100 mg L-1), respectively. Therefore, it was concluded that the maximum enzyme activity of 257 MCU mL-1 of fermentation broth was after approximately 72 h of cultivation when culture cells were in their late exponential growth phase and decreased after 96 h when the cells reached the stationary phase. The increase in activity was due to the quality of enzyme produced (Figures 5 and 6A). Furthermore, when the original MCAP gene was adapted to the optimal codon usage of P. pastoris, the expression of aspartic proteinase in P. pastoris (X-33/pGAPZα+SyMCAP-6) increased by nearly 40%. The amount of MCAP produced after 72 h of cultivation was 186 mg L-1 and the maximum enzyme activity was 580 MCU. The amount of MCAP in the culture supernatant was estimated as the difference between the calculated proteins produced from the recombinant P. pastoris and wild-type P. pastoris, as well as by considering the band intensities on SDS-PAGE. Extracellular production of MCAP from recombinant P. pastoris X- 33/pGAPZα+MCAP-5. A) Time course in YPD medium containing 4% glucose at 24°C. B) Production of aspartic proteinase after 72 hours in YPD medium containing 4% glucose. The values shown are the mean activity with standard deviation obtained from three sets of experiments. The recombinant P. pastoris with the original MCAP gene was grown for 72 h at 23, 24, 25, 27 and 30°C and the enzyme activity of 178, 260, 248, 224 and 145 MCU mL-1, was obtained, respectively. Temperature seemed to affect MCAP expression in P. pastoris and the optimum temperature for the MCAP production by X-33/pGAPZα+MCAP-5 was found to be 24°C (Figure 6B). The effect of pH on the activity of the recombinant enzyme produced in the culture medium incubated at 24°C for 4 days and supplemented with 40 g L-1 glucose was investigated. When the initial pH of the culture medium was 7 instead of 5, the relative enzyme activity was reduced to 55.6% while the levels of protein expressed decreased only by 5%. Additionally, regardless of the temperature, X-33/pGAPZα+MCAP-5 and X-33/pGAPZα+SyMCAP-6 produced four forms of the recombinant protein with molecular weights of 44, 40, 37 and 33 kDa when the initial pH value of the medium was 7 (Figure 5). After the cultivation period the pH of the cultivation media decreased from 7 to 6.3 thus confirming previous observations made for Mucor sp. Rennin. The model for the processing of prepro-MPR, a zymogen of Mucor sp. Rennin expressed in S. cerevisiae, where it was demonstrated that prepro-MPR matured under the acidic pH . This suggests that the MCAP forms of 44 and 40 kDa were also glycosylated and inactive. However, they were converted to the mature proteins with a molecular weight of 37 and 33 kDa at pH 5.0. The MCAP proteins were tested for milk clotting activity at various pH values. The maximum activity in all proteins was observed at pH 3.6. At pH 7.0 the activity decreased drastically and the damage was irreversible. For this result, the histidine-tagged recombinant protein (MCAP) was not purified by affinity chromatography on immobilized metal (IMAC). The MCAP activity was determined as a function of temperature from 35 to 65°C. It was found that the activity was highest at 60°C regardless of protein type. In some cases, activity began to decrease at temperatures above 50°C. For this reason, thermostability was tested by incubating the enzyme samples at temperatures ranging from 55 to 60°C. The non-purified MCAPs retained 75% of their activity at 55°C and 40–60% of its activity was retained at 60°C after 60 min incubation at pH 3.6 (Table 3). Also, it was found that the purified MCAP could not retain much activity compared to the non-purified protein. Purified MCAPs retained less than 40% of their enzyme activity at 55°C after 30 min incubation at pH 3.6 while the commercial preparation of R. miehei showed 85% of residual activity under the same conditions. Therefore, the purified MCAPs have a remarkable difference in thermal stability in comparison to the commercial protease from R. miehei. The enzymes that are sensitive to heat treatment are considered suitable for milk clotting and for that reason; MCAP is a potential alternative for industrial utilization. *Enzyme having (2.5 kDa) the additional amino acids of the C-terminal polyhistidine tag. **Thermal stability of the enzymes at 55°C, for 30 min. The ratio of milk clotting activity to proteolytic activity (MCA/PA) of MCAP was compared to the value observed for commercial rennet preparation. The higher the MCA/PA ratio the more desirable the enzyme is during cheese making. Table 4 shows the MCAP ratio of about 20, which is below the calculated ratio for chymosin preparation. Results shown are the means of three sets of experiments. The expression of MCAP under the control of the constitutive GAP promoter was investigated. P. pastoris was shown to be a good host for the production of MCAP protein and the novel MCAP was efficiently secreted into the medium to concentrations exceeding 180 mg L-1. Similar results were obtained by Yamashita and coworkers who cloned the M. pusillus Rennin gene in S. cerevisiae cells . P. pastoris secreted two forms of MCAPs where one form was glycosylated while the other was non-glycosylated and similar to the authentic aspartic proteinase of the M. circinelloides. The observation was correlated to the presence of an N-glycosylation site Asn-Phe-Thr at position Asn331 of the amino acid sequence of MCAP. Previous reports show that aspartic proteinases expressed in S. cerevisiae[21, 22] and Aspergillus nidulans were secreted as single protein bands and in most cases glycosylated . However, previous observations have shown that a mutant strain defective in N–glycosylation process of M. pusillus excreted three glycoforms of M. pusillus proteins . P. pastoris strain SMD1168 transformed with pGAPZα+MCAP-5 also excreted two forms of MCAPs (unpublished data). Interestingly, the MCAP protein contains the sequon located towards the C-terminus (Asn331 according to the MCAP of 394 amino acid residues). Therefore, P. pastoris can possibly excrete two forms of MCAPs. Results obtained by Shakin-Eshleman et al., suggest that a particular amino acid at the X position of an Asn-X-Ser sequon is critical for Core-Glycosylation Efficiency (CGE) . They found that the substitution of the amino acid X with Phe, increases the efficiency of core glycosylation. In fact, MCAP contains Phe at the X position of the sequon. The result showed that the density of the band representing glycosylated recombinant protein was more intense than the recombinant non-glycosylated protein. To elucidate the origin of the two types of proteins, mutations could be generated at the Asn-X-Ser sequon of MCAP. The sequences for MCAP determined in this article have been submitted to GenBank under accession numbers JQ906105 and JQ906106. Jose Antonio Gama Salgado, Martin Kangwa and Marcelo Fernandez-Lahore contributed equally to this work. Partial support for this study was provided from Project PGSYS-EXCHANGE EU-PIRSES#269211, ERA Net Euro TransBio-3, PGYSYS and Jacobs University Bremen. JAGS, MK and MFL have designed the work. JAGS carried out the experiment. JAGS, MK and MFL analyzed the data and contributed for the statistical analysis. JAGS, MK and MFL wrote the manuscript and reviewed the manuscript critically. All the authors have read the article and approved the final manuscript.